Life and challenges—two virtual provisions. These two terminologies are integrated constituent of each other. We are all consequently dissimilar and sundry; in persona and milieu, race and dogma, perceptions and stance, judgment and emotions, aspirations and needs but sooner or later we all come down to being humans and that means we are all alike. There is one fixation in frequent involving every personage—Challenges of life. A number of populace exists whom we dub DISABLED. Do we know what the accurate connotation of being disabled is? Why can’t we call them differently able? The challenges of their lives are a smidgen divergent than vigorous folks. But these extraordinary challenges don’t make them contrasting from the able-bodied individuals. These differently gifted people have proved that it’s about abilities and not disabilities. They believe that disability is in the psyche; they don’t ever get nervous about their disabilities; they believe that they can do anything as a normal person. They believe in themselves; they believe in “YES, I CAN”. Regardless of being struck by polio as a youngster, Raghavendra Anavekar has done the country conceited. But unfortunately how many of us know who Raghavendra Anavekar is? How many of us know what Paralympics is? “Paralympics is a good platform where I can show my achievements and improvements. We make many relations with different people during Paralympics” quoted Raghavendra. This Paralympian Swimmer did not face much hindrance in leaving the Bangalore airport when he arrived from the Guangzhou Asian Para Games. “When cricketers come after winning a match thousands of people are there to welcome them. But when paralympians return after winning medals there is no one to give them a warm welcome” said Raghavendra’s coach Umesh G. Kalghatgi. There were no TV cameras to persecute him, no glowing officials compartmenting garlands, no friends to give him a thump, no fireworks, and no sweets. With an Asiad bronze medal with his cases, though, the 24-year-old wasn’t belligerent. “When I started in 2003 nobody knows what Paralympics is. But now the common people know about Paralympics and Paralympians” quoted Anvekar. Anavekar have earned consign on the plinth from his time of 3:22.50 in the men’s 200m (SM6) individual medley. The place is a few hundred kilometers north to Belgaum. There he had taken his first stepladder in swimming. Incapacitated by Polio in both legs from birth, Anavekar was introduced to swimming at the age of 14, at the Rotary Corporation pool in the township. “At the age of 14 I visited Rotary Corporation Sports Academy, a member of Association of Physical Handicapped. They asked me whether I want to learn swimming or not. I said yes. They gave the number of a coach named Umesh G. Kalghatgi. I went to him along with some of my friends. At first he thought whether I will be able to do it or not. Afterwards he started teaching me swimming” said Raghavndra. “Raghavendra Anavekar was my first student” said the coach. Umesh G. Kalghatgi, coach of Raghavendra has been associated with swimming for the last 10 years. “I wanted to support these kids who are not being supported by others. Someone has to be there who can motivate them so that they can do something on their own” quoted Umesh G. Kalghatgi. When asked about the problems at the initial stages of learning swimming Raghavendra said, “I knew I can do it. I use to watch other kids swimming and use to learn watching them. I decided that I have to do it.” His coach said, “As I was training someone like Anavekar for the first time I was extra alert so that I can teach him perfectly”. In 2002, he stared endearing medals. He was distinguished as the best male swimmer at the National Paralympics Championships in Gwalior. Anavekar won four old medals on that instance. 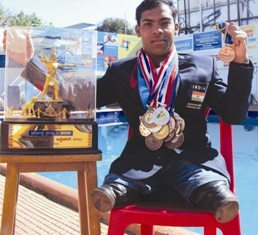 “After winning four gold medals at the Paralympics Championships in Gwalior I took swimming as my profession” said Raghavendra. “I have a fellow Para-athlete from China (he was not been able to pronounce the name) whom I have always wanted to give a tough fight” he said keenly when asked about competitors in Paralympics. He traveled to Hong Kong next year for the FESPIC Youth Games which was his first international meet. “At Hong Kong I won three silvers and three bronzes. It was unbelievable for me. I belong to a very poor family. When I sat at the flight I felt like heaven. Representing your country outside and winning medal there is very special” quoted Anavekar with excitement. When he returned with an international medal, Belgaum was welcoming him. They were proud of him. “Everyone was very happy and was proud of me” said Anvekar. But what the Karnataka Government has done for this endowed Paralympian? Raghavendra said, “From 2002 I didn’t get any support from them. But the sports lovers, my neighbors and well-wishers supported me a lot.” For not getting this support Raghavendra sometimes feels of representing some other state. “Yes. Sometimes I feel representing some other state. When I go outside for events the kids from other state tell me to leave the medals for them so that they can get more cash from their state. But I always fight for my state” quoted Raghavendra. The Paralympians have to fight at every footstep. They have to fight for their rights. “We the Paralympians don’t get our deserved rights and we fight at every step of our lives. We have to request to get our deserved chance” said the swimmer. From FESPIC Youth Games he returned with three silvers and three bronzes. Till now his medal tally from international events stands at 19 together with two gold medals. The swimmer won the Ekalavya Award in August last year. Anavekar has been trained under Umesh G. Kalghatgi at the Aquarius Swim Club in Belgaum, and under S.R. Sindia when in Bangalore. He has tried his hands at long-distance swimming, even attempting to cross the English Channel in 2008. But he had to withdraw midway as the water was very cold and he started cramping severely. Training is very important for Paralympians. But as unfortunately India still doesn’t know what exactly Paralympics is, the training facilities are not so smooth for our Paralympians. “I practice in a 21 meter pool, 3hrs a day. The kind of training that we should get is not available in India. But I hope very soon we will surely get our kind of training” said Anvekar. Also, Paralympians don’t get sponsors like other able-bodied sports persons. “After winning Asian medal in 2010 some sponsors approached me.” When asked about appealing to sponsors he said, “I live in a very small village Belgham where I can’t approach to much sponsors. I work as a part time coach at the Rotary Corporation Sports Academy. But I want my state to help me” said Raghavendra. Even he has to manage his sports gear on his own. “I haven’t got the proper swim suits till now” he replied. Not only Para-athlete, their coaches also don’t get any assistance from the government. “As a coach I have never got any kind of support from the government” said Umesh G. “No sponsors approach the Paralympians on their own. We have to go and request them for sponsorship. The government should give them jobs so their financial condition can get improved because most of the Para-athletes come from poor families” said he. “For some problems of the federation we have to face problems. For their internal confusions the Para-athletes suffer” Raghavendra said on the responsibilities of the Paralympics federation about the athletes. When these kinds of state of affairs arrive the athletes feel that they should leave sports. “When we don’t get any support from the federation itself we think of leaving sports. We practice throughout the year and when at the last moment some negative situation arrives, we feel really demoralized” quoted the Paralympian with grudge. They don’t want consideration from people. They don’t want people to pity on them. They just crave for their rights because they deserve. “I don’t want to get treated differently” said the swimmer. The Paralympians of India represents India like any other normal athlete. “We are a part of India and hence we represent India” quoted the swimmer. Cricket is the most popular sports in India. But every other sport should be treated by the same token. “I don’t blame cricket. In fact I have grown up watching cricket. But one should respect other sports also. I don’t want sympathy. I want support” said Anvekar. “My three Paralympian student has brought 36 medals from international events. The Paralympians are doing a fantastic job and if they get more support from the government and the people they can create history”quoted the coach. We the Civilian Welfare Foundation salute the fidgety labors of the Para-athletes of our country. Let’s give them the hold that they need. Let’s be a twig of their lives and rally round them getting their deserved civil liberties. Interviewed, compiled and written by Dhimoyee Debnath. She is a graduate from International School of Business & Media, Kolkata in Media studies and is an active member of Civilian welfare Foundation. She is an Anchor Producer by profession at ABP Ananda. Email her at dhimoyeedebnath@cwforg.com for any queries related to the article.